If Valentine's Day makes you think of roses, chocolate, and wine, it probably also makes you think of decadence. 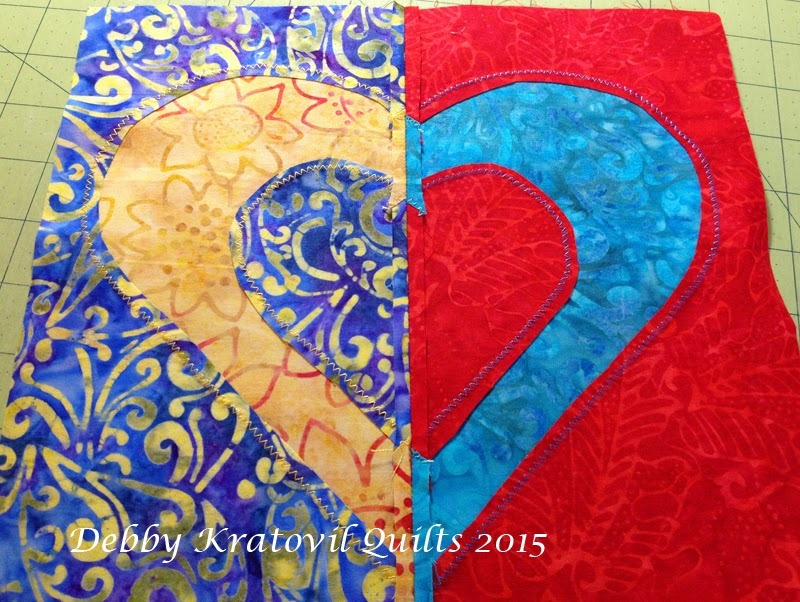 And there's nothing more decadent than vibrant, bold batiks--they'll spice up any design! 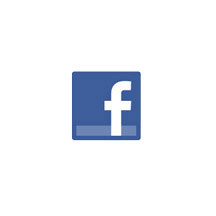 I woke up one morning in 2004 with an image of a split heart, each half on a rectangle background. I couldn't wait to get down to my sewing studio. I drew a half-heart and then its mirror image. Then I rummaged through my small stash of batiks. The rest is history! 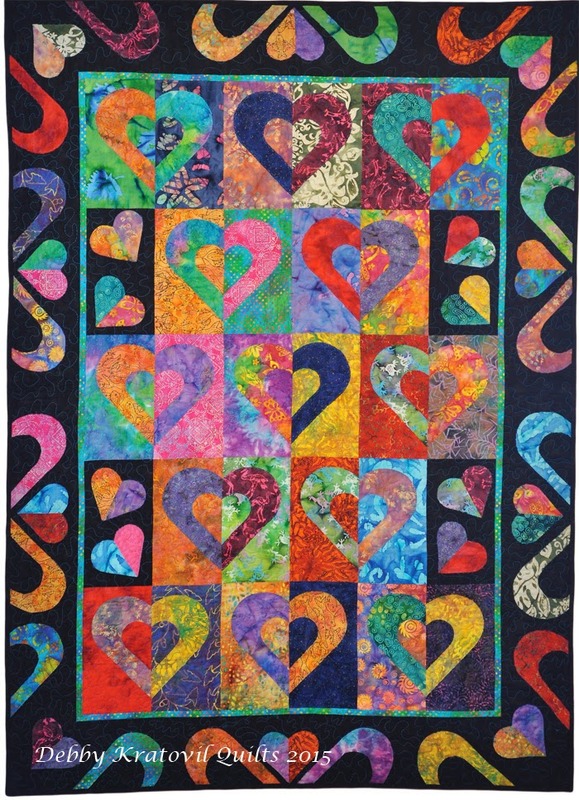 It was published in Quilt Magazine twice and also was the February quilt in my 2012 Wall Calendar of Quilts. Here is my approach to this pattern. But I first needed some glorious batiks to demonstrate the steps. These batiks supplied what I needed! First, you need the template! The link for the pattern for the block and quilt is at the bottom of this post. The block is in two parts, with a left and a right half-heart. 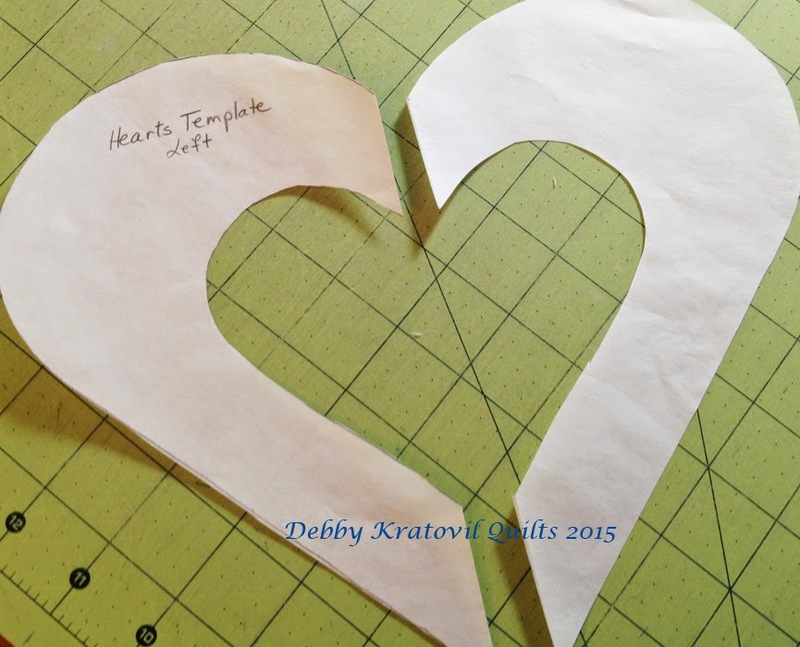 Use freezer paper to trace the half-heart from the template page. You can make a left and right template, or use the same template and cut half of your patches from the wrong side of your fabric. I like to use freezer paper because I can iron it to the right side of my fabric and I don't need pins. I cut it out and then reuse it to cut out more patches. Don't throw these cutaways away! They are perfect for cutting little hearts. 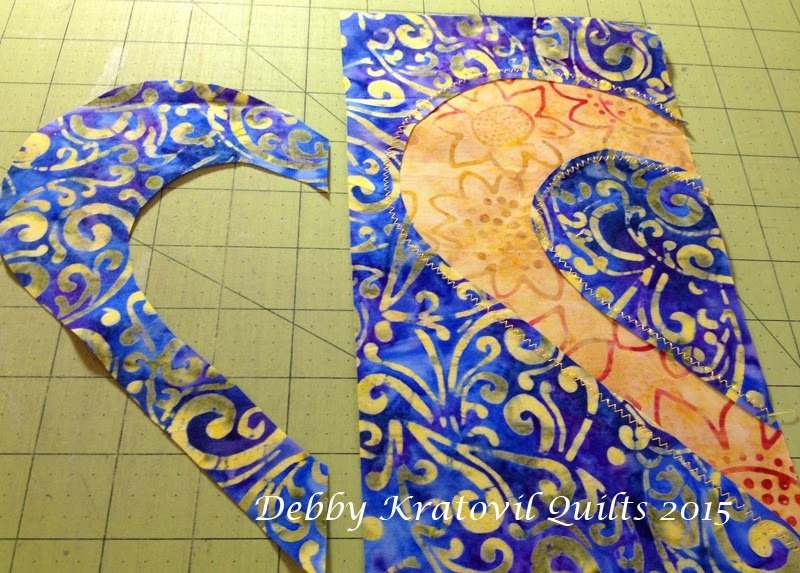 Now, we use the large templates and iron them onto rectangles of batiks cut 5-1/2" x 9". DO NOT USE FUSIBLE WEBBING ON THE BACK OF THESE. You do NOT want to fuse these patches to the background fabrics. A light colored heart fused to a dark background rectangle will change color. 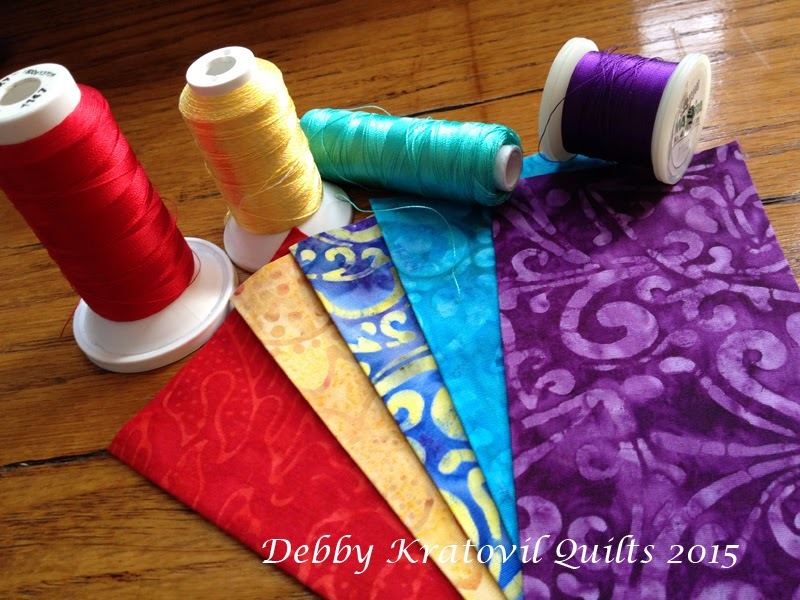 A batik fabric has a high thread count and has minimal fraying. I have used fusible interfacing on the back of quilter's cottons, but never fusible Heat 'n Bond or Wonder Under. IMPORTANT NOTE: Once you pin the first heart to the background rectangle (the one on the left), you will use this to align the mirror image unit (on the right). Then you use that one to help pin the next left one, and so on. 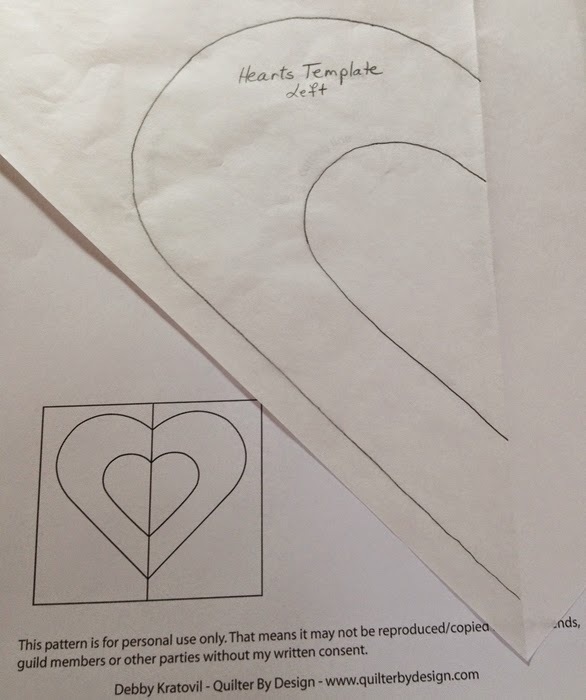 I am planning for 5 blocks, so I need 5 half-hearts for the left and 5 half-hearts for the right. I cut everything out, placed the patches together to make sure I liked the arrangement before I pinned all of them. Now it's time to stitch! 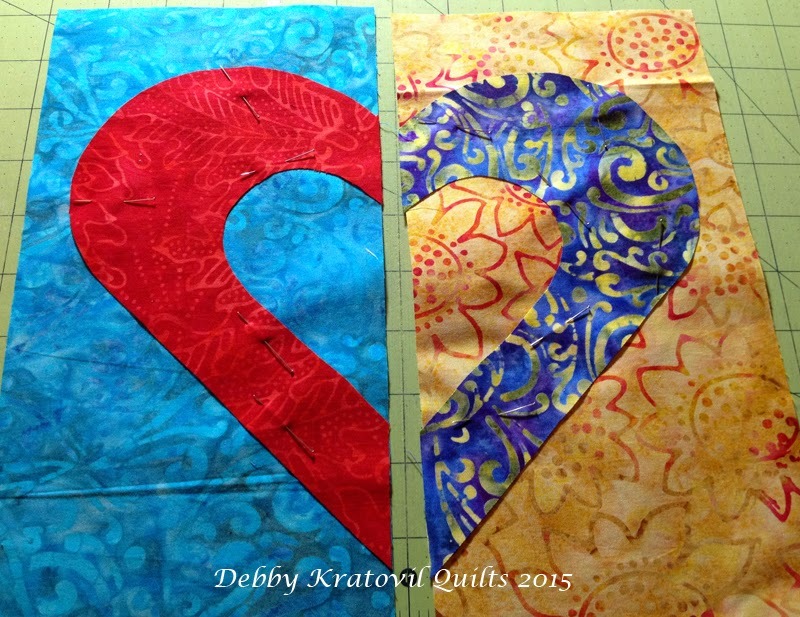 With my original quilt, I chose a turquoise rayon thread to use for ALL of the hearts. For this quilt I got a bit more particular, as you can see. I pulled out my threads to match the hearts. Time to stitch. I used a machine zig zag stitch. 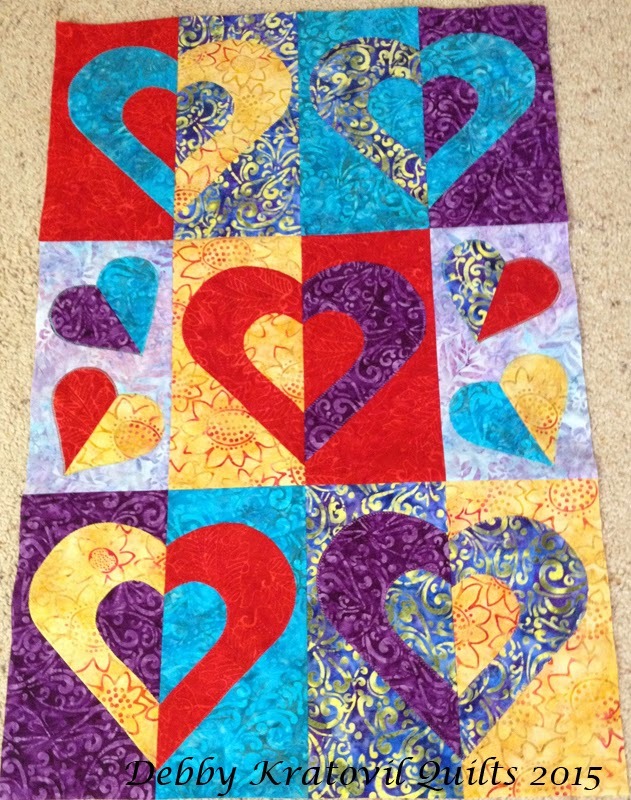 I used these trimmed hearts in my outer border (see in quilt above). Nothing went to waste here! And how does it look from the wrong side? And let's see what I did with those little cutaway hearts! I cut two 5-1/2" x 10-1/2" rectangles of the lavender and blue batik. Then I stitched the little half hearts together and made four of them. Placed; stitched; added all together for this little mini: 20" x 30", needing borders. Wow, that's fun, huh? And the pattern is now YOURS as a special Valentine's gift from Benartex and me. All you have to do is download it. 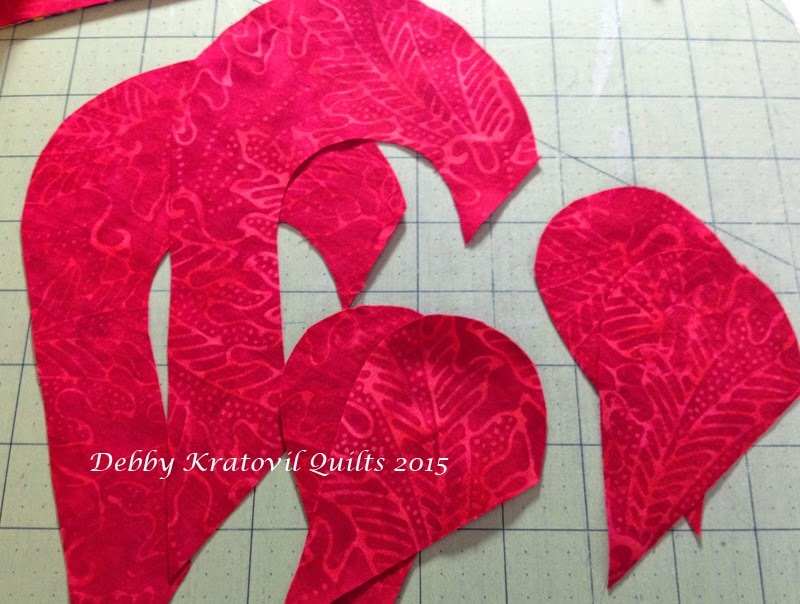 Click here for the Hearts on Fire Pattern by Debby Kratovil. Thanks Debby! 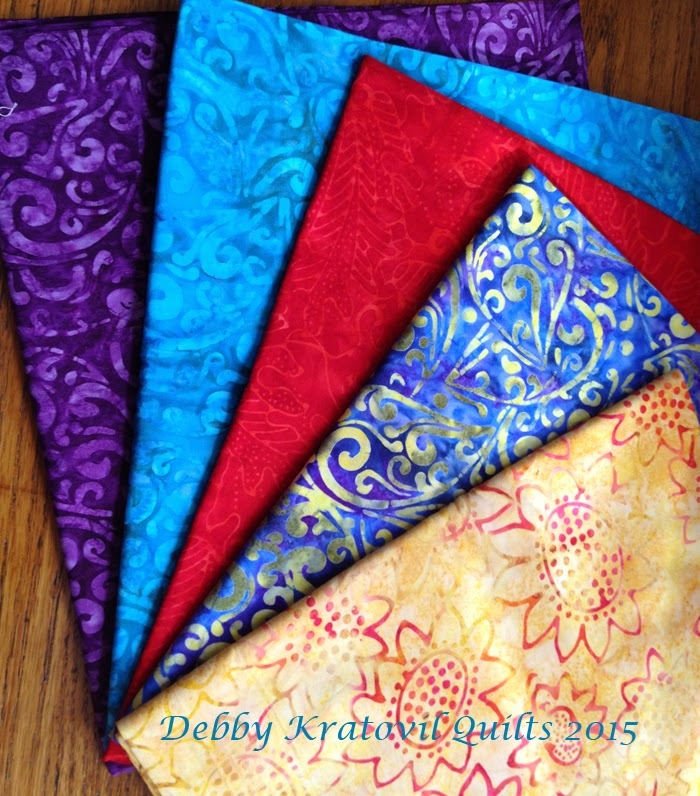 Head over to Debby's blog to find out how you can win a fat quarter bundle of some of Benartex's beautiful batiks. This is just so striking and a great tutorial on acheiving such a lovely little piece. That is really pretty. I love all of the batiks in this design. How can you look at that quilt and not smile? I love this project!!! Thanks so much! 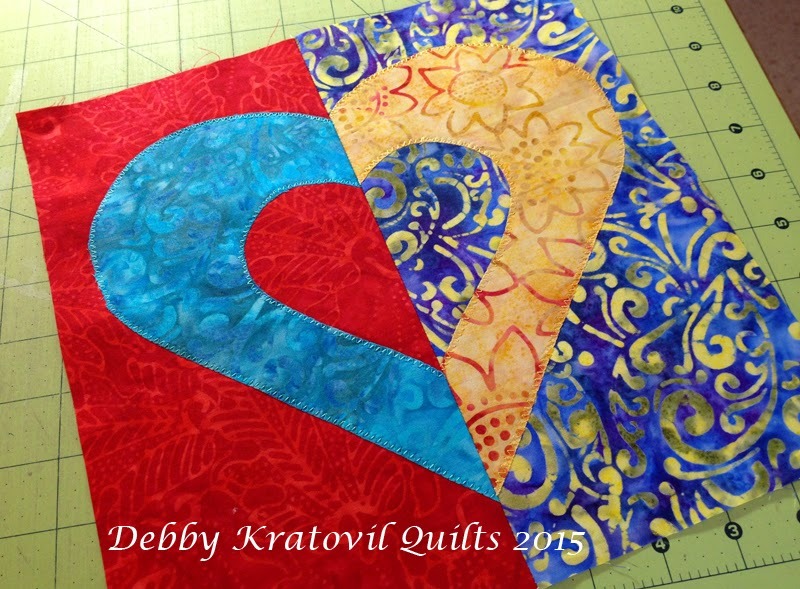 This is such a great design on Debby's quilt. I really like it. The fabrics are just gorgeous! I especially love the purple. Beautiful! Thank you for the pattern and great tutorial. 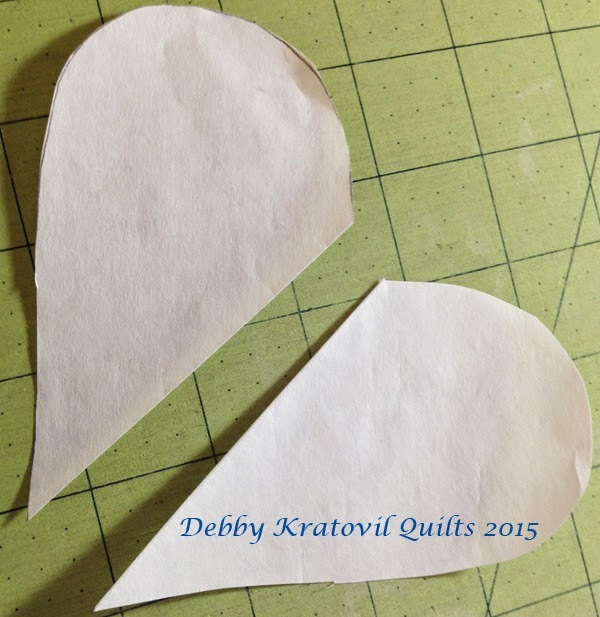 You have the perfect Valentine pattern and can't wait to make one myself. Having your tutorial to help show me how to do it surely helps. Thank you for sharing with all of us. I really do learn from these tutorials. 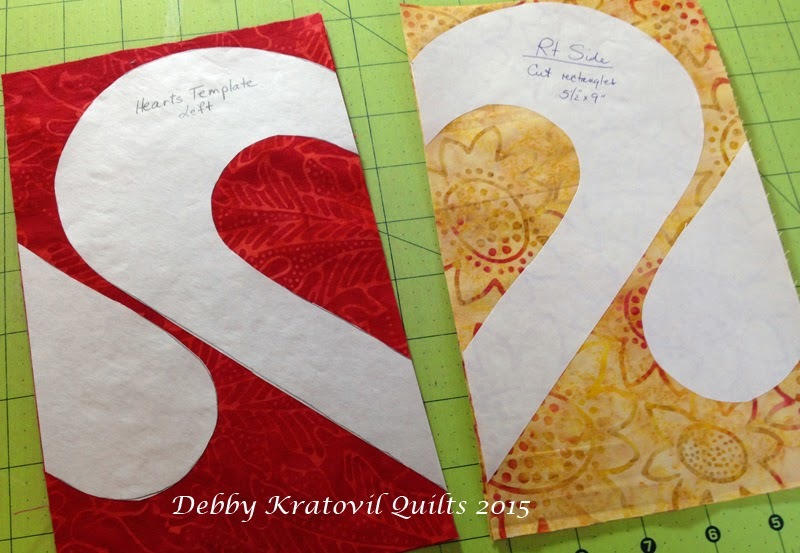 They are a great inspiration and a great way to learn outside of your quilting box. Gorgeous and fun. Perfect combination. These hearts & the fabrics made my heart beat a little faster. Thank you so much. This is a wonderful project. I will save it for someone special. Thanks for the pattern. It is beautiful! Thanks for this great pattern. I love the whole right/left side idea. And the fabrics are gorgeous. Love it. It's on my bucket list. Pattern is printed and filed away. Someday!!! !